Cloud Computing: Green or black? At last week’s JISC Conference (Elizabeth II Conference centre, Westminster, 12/13 April) green was definitely the new black. There was a parallel session on Reducing your carbon footprint and the closing plenary given by Bill St. Arnaud looked primarily at how the Higher Education sector can green-up it’s ICT. One of Bill’s sources was the recent data centre report by environmental group Greenpeace. The report entitled Make IT Green: Cloud Computing and its Contribution to Climate Change asks for data center builders to become part of the solution to the climate change challenge, rather than part of the problem. In the report Greenpeace projects that data centers could consume up to 1 million megawatt hours of power by 2020, with the telecom sector using another 950,000 megawatt hours. 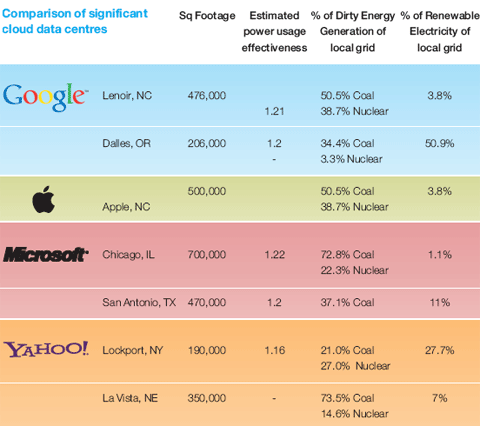 A comparison of the carbon footprint of data centres is given below. One suggested way data centres can be greener is by moving away from coal power and building in places where renewable energy is possible. At the JISC conference Bill St. Arnaud called for UK HE to do something similar with its server rooms. In the future the cost, both economically and environmentally, will be in carbon emissions, not in energy usage. Improving energy efficiency is only part of the solution. UK HE has an opportunity to be the leaders in this area by moving their server rooms out of hot cities and too remoter locations where they can use renewable energy. 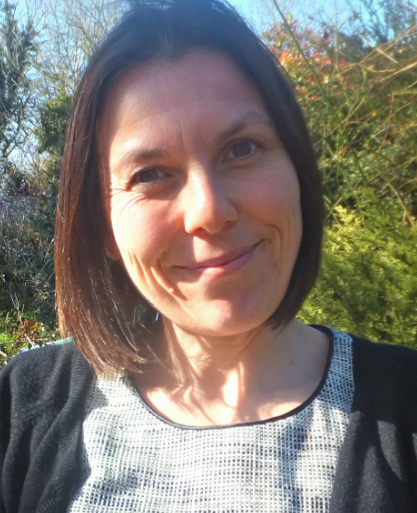 Further discussion on data centres and energy use on the data centre blog. Remotely hosted – Services or data are hosted on someone else’s infrastructure. Ubiquitous – Services or data are available from anywhere. Commodified – The result is a utility computing model similar to traditional that of traditional utilities, like gas and electricity. You pay for what you would like. Cloud computing works using economies of scale. It lowers the outlay expense for start up companies, as they would no longer need to buy their own software or servers. Cost would be by on-demand pricing. Vendors and Service providers claim costs by establishing an ongoing revenue stream. Data and services are stored remotely but accessible from ‘anywhere’. It enables services to be used without any understanding of their infrastructure. They are supported remotely. The last point in particular could have significant effect on us remote workers. At the moment if you work from home it is difficult to get the type of IT support that you would get in the office. This is something I touch in in my recent Ariadne article. If we begin to rely more on services that are hosted in the cloud this will mean that in theory we will need to rely less on our on-site IT services team. In a way everyone will become remote workers and support will be dished out in the same way – from the Internet. Use of cloud computing means dependence on others and that could possibly limit flexibility and innovation. The ‘others’ are likely become the bigger Internet companies like Google and IBM who may monopolise the market. Some argue that this use of supercomputers is a return to the time of mainframe computing that the PC was a reaction against. Security could prove to be a big issue. It is still unclear how safe outsourced data is and when using these services ownership of data is not always clear. There are also issues relating to policy and access. If your data is stored abroad whose FOI policy do you adhere to? What happens if the remote server goes down? How will you then access files? There have been cases of users being locked out of accounts and loosing all access to data. I suppose at this stage it might make sense for us not to put all our eggs in one basket so to speak. My colleague Brian Kelly has offered some thoughts on his blog on what outsourced services might actually work in the cloud. So what do you think? Do those behind it have their heads in the clouds?